Air conditioning systems are very important in every Florida home. With warm weather almost all throughout the year, it is essential for every family to have a working AC to make their home cool and comfortable. However, there are times when even the most trusted AC system has trouble working and so a reliable AC repair company must be called. 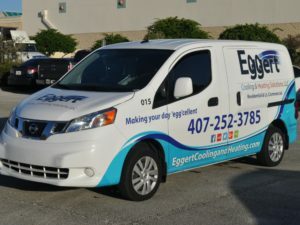 At Eggert Cooling and Heating, we have a team of highly trained and skilled staff and crew who can help you out not only with AC repair but also preventive maintenance. You should know that to avoid having problems with your AC system especially during seasons when you need it the most, proper maintenance is a must. Furthermore, some knowledge of basic troubleshooting and maintenance can be very helpful. These include regular inspection of the AC filter, cleaning the AC when necessary, and more. We want our clients to have functional and efficient HVAC systems in their home at all times, which is why we strive to provide the best AC maintenance services. As mentioned, AC trouble can still happen and we are happy to inform you that our 24/7 emergency service team will be there for you anytime, any day. You don’t have to wait until your AC stops working. When it seems to be operating in an unusual way, for instance, if it gets noisy, it blows warm air or takes too long to get a room cool, then AC repair may be necessary. Just give us a call and we will come straight to your home to assist you. We are proud to share with you that our team has decades’ worth of HVAC maintenance and repair experience. We can handle all kinds of AC repair requirements. Whether you need service for your residential or commercial property, we can help you out. We have the tools and equipment necessary to carry out any AC installation, maintenance, and repair job done properly and within a timely manner. Best of all, we make sure that our rates remain honest and reasonable. Looking for a reliable AC repair company? Eggert Cooling and Heating is here to help you out. For all kinds of AC trouble, we will assist solve and fix the problem. We are available in Orlando, Apopka, Clermont, Maitland, Windermere, and nearby communities in Central Florida. Call us at 407-252-3785 to get a free estimate!